Have you met Parsley yet - the little guy with a box for a body and shredded cardboard ‘parsley-top’ hair? His day job is to star in the new Mail Boxes Etc. YouTube videos, but he’s just been let out to play – quite literally – to celebrate the summer of sport. That’s why you’ll now find him over on Google play and the App Store (and even on a desktop near you), having a bit of fun. 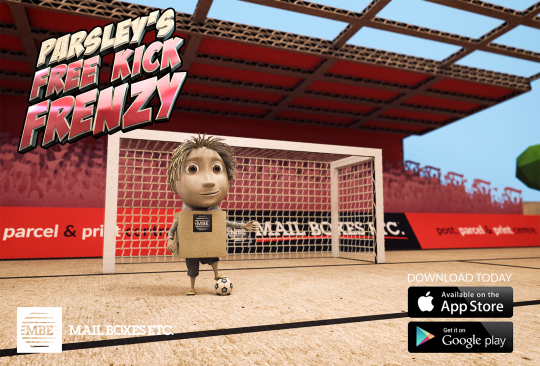 Parsley’s new incarnation is as a goalie, and despite his little arms he’s happily deflecting free kick goals – as well as occasionally letting some into the net – in MBE’s first ever game app, Parsley’s Free Kick Frenzy. It seems everyone is mad for the beautiful game this summer, so who are we to deny them their chance to unwind with a little light gaming, compete against a few mates, or go large and smash their score on the national leaderboard? Whether you’re into footie or not, this game’s pretty compelling. It’s really easy to play, and the great thing is, you don’t even have to get out of your seat. Parsley’s surprisingly skilled at saving the ball. But don’t despair, players are given every chance to demonstrate some skill of their own – particularly when the stakes get higher and the ball has to dodge various obstacles (in the shape of parcels, of course) on the pitch to get to the back of the net. So if you think you’ve got what it takes, why not download the app now? It’s a chance to have a bit of fun while testing your talent. You could challenge your work colleagues, create a table and see how you get on against them. Hone your skills when it comes to curving the ball and dodging those obstacles. And who knows, you might even get to the top of the league. If you log in with Facebook you can take on anyone else who’s playing – wherever they are in the world.